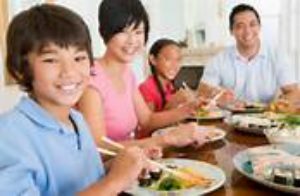 Kids who live in families that eat dinner together regularly are less likely to be involved in at risk behaviors. According to the 2000 study done by the National Center on Addiction and Substance Abuse at Columbia University (CASA), children who don’t eat dinner with their families are 61 percent more likely to use alcohol, tobacco, or illegal drugs. By contrast, children who eat dinner with their families every night of the week are 20 percent less likely to drink, smoke, or use illegal drugs.